You are here: Home / Janaia's Journal / Be Rain Wise – Catch That Rainwater! 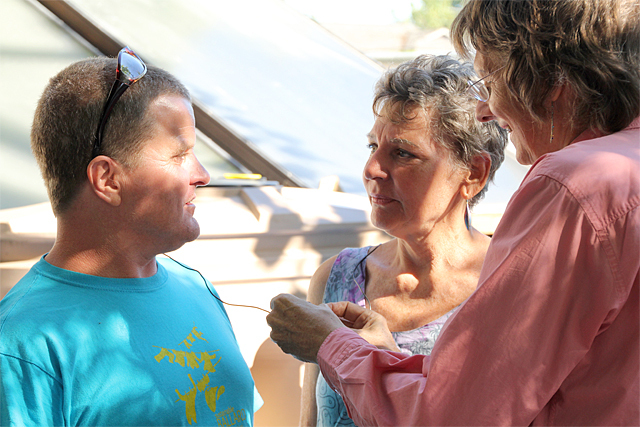 Our friend and Peak Moment guest Jim Bristow (This Old House – Rethink, Reuse, Remodel, episode 195) is working at the heart of the RainWise project. He explained that extreme storms overload Seattle’s big runoff storage cisterns, causing increased pollution in the local waterways. The RainWise project puts rain gardens on private parcels, where water is percolated or slowed down in its journey, thus reducing the load on the city’s runoff system. On many lots, Jim is also installing cisterns, which store roof rainwater before it goes to the rain garden. 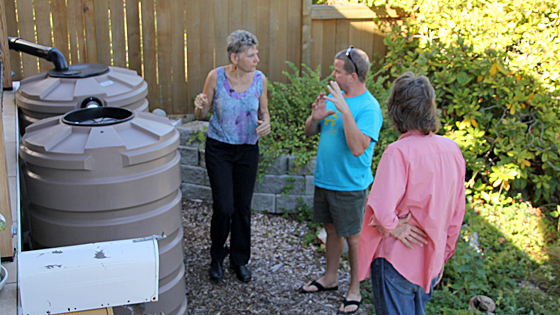 In summer, that stored rainwater can be used for watering a garden. Or with filtration, used for emergencies. 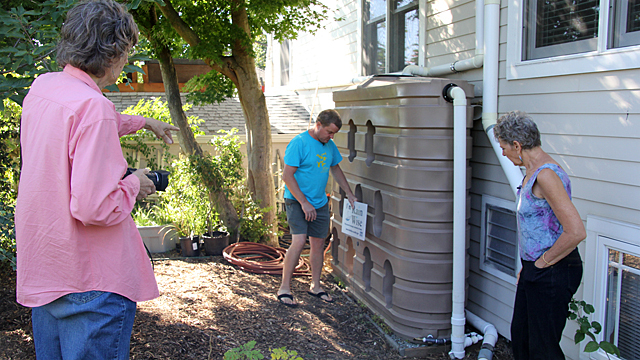 We videoed the cisterns and rain garden at Jim’s house. Thanks to his friend Mark Early, here are some behind-the-scenes shots of a Peak Moment TV show in the filming. Watch Catching the Rain, episode 255. I love your program because you always provide content that can be incorporated into our lives. However, I must say that Ep. 238…Splendid Bikes was a real turn off. I loved the message…don’t get me wrong….and love that people are trying to make this a better world by doing what they can. But in the first two minutes, I counted over a DOZEN times that Joel said “you know” “you know” “you know” “you know”….it became so distracting I had to stop watching.